Interactive Media Creation refers to the products and services on digitally-based systems that respond to the user’s actions by presenting and engaging directly with content (including text, moving image, animation, video, audio, and games). 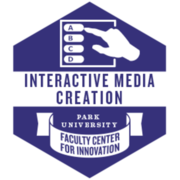 This badge represents focused faculty development to learn about how to develop and create interactive media in the learning environment. Recipient participated synchronously or asynchronously in a Faculty Center for Innovation-sponsored learning community on the topic of Interactive Media Creation and has produced a written reflection on how the knowledge gained has affected his/her teaching, scholarship, or service.